Plaid Cymru has intensified its campaign to get Wales a bigger share of UK government spending on the HS2 high-speed rail line in England. The party claims Wales could be missing out on millions of pounds every year through the £55.7bn HS2 project. The Treasury denies Plaid Cymru's claim that Wales is not getting a fair share of the money spent on the scheme. The new high-speed line is aiming to link London to Birmingham by 2026, with routes to Manchester and Leeds by 2033. When transport spending increases in England the Welsh government's budget grows under a funding formula - although Scotland and Northern Ireland's share is higher. Plaid says the difference is explained because the other nations are getting a share of HS2 spending, but the UK government says it is because rail infrastructure is not devolved to Wales. Both the UK and Welsh government insist the Welsh government is getting a share of increased transport spending. 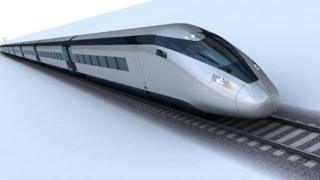 But Plaid Carmarthen East and Dinefwr MP Jonathan Edwards said that when spending on HS2 increases after 2021, the loss to Wales will be hundreds of million pounds more than expected, and that the party's analysis is supported by the House of Commons library. Mr Edwards said: "Both Labour and the Conservatives are guilty of letting Wales down badly on the issue of fair funding from HS2. "This is the most important capital infrastructure project to be funded from general taxation, including Welsh taxes, in the next two decades - with independent analysts expecting costs to reach at least £80bn. "Due to the vast sums involved, the people of Wales would expect both the Wales Office and the Labour Welsh government to ensure that Wales is not left behind." A UK government spokesperson said: "Over £750m of the £900m increase in Welsh government capital budgets over the next five years has been directly generated by increases in Department for Transport's capital spending, including HS2. "This is because in Spending Reviews the Barnett Formula is applied at the departmental, not the programme, level. "Of course, Wales also continues to benefit from UK government investment in rail infrastructure in Wales. "The comparability percentage for HS2 in the Statement of Funding Policy is set at zero simply because the Welsh government is not responsible for funding rail infrastructure in Wales." On Monday, the Welsh government rejected what it called "misleading statements" about HS2, and said ministers had ensured Wales would get extra money as a result of the project.